For some time now, I had wanted to see the United States Holocaust Memorial Museum in Washington DC, but for one reason or another, other attractions in that city had always taken priority. Because of a wedding in northern Virginia the past weekend, it gave me a chance to visit Washington again, and I made it a point to visit the Holocaust Memorial Museum this time. I visited the museum on 19 Jun 2006 on a hot early summer day. The day started with me talking south across the National Mall toward the museum. Even though I have already lost count how many times I had been on the grounds of the National Mall, the Washington Memorial and the WW2 Memorial at its shadow still awed me. When I finally arrived at the museum at 9:45am, I was a bit surprised to see a line already forming down the entire one side of the building. The museum was completely free, like most of the museums in Washington, but to control traffic the museum used timed tickets to make sure the main exhibit does not become overcrowded. When the museum gates opened its doors at 10:00am, the line moved slowly. One particular note worth mentioning was the security at the front door. Even though all museums in Washington DC employed security measures, I feel that the Holocaust Memorial Museum's security rivals airports. I had to place my backpack on a conveyor belt that led into an X-ray machine, and all electronics and anything metallic had to go in a small tray that also went onto the conveyor belt. As I walked through the metal detector without incident, the X-ray scanner operator told me that he saw two bottles of water in my bag that he would like to check out. I took them out, and he told me to open them and take a sip out of each one to show him that the content was indeed water. I was a bit taken back at the comprehensiveness of the security check, but it was also very comforting at the same time that the museum took the safety of its guests very seriously. I made it into the lobby and took a look at my timed ticket. 11:30am, it said, but I knew there were other exhibits that were open to the public without needing the ticket, so the hour-and-half wait was not going to be a problem. The first stop I made was an exhibit called "Remember the Children: Daniel's Story" on the right-hand side (northern side) of the lobby on the first floor. Daniel was a fictional figure created based on the collective experiences of the many children who witnessed the Holocaust, and the exhibit was created to suit younger audiences; "[r]ecommended for visitors 11 years and older", said the museum's literature. Told from the perspective of Daniel, the exhibit started by taking me to Daniel's happy childhood. I saw a reproduction of a typical Berlin urban dwelling with Daniel and his younger sister's laughter playing in the background from hidden speakers; his toys and books laid about in his bedroom as if he was just there last week. 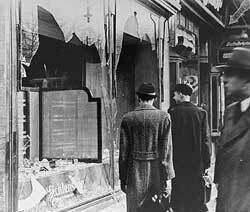 Through historical photographs much like the one on the right, Daniel told that things were changing; of course, we know that he was telling of Kristallnacht, the Night of the Broken Glass. The family store was vandalized, and their synagogue set on fire. At school, some of the children called him a Jew as if it was something to be ashamed of. He and his family were sent to a ghetto. Many of his things were left behind, but he held on to the WW1 medal that his father had given him (which was reminiscent of Anne Frank's father). He lived in an apartment of a single room with his whole family, and his meals consisted of little more than boiled turnip and stale bread. His mother tried to make the best of it for him and his sister, but the 11-year-old Daniel was old enough to somewhat understand what was going on. Suddenly, the dimness of the ghetto changed to something even more depressing. Daniel's family had been deported to a concentration camp. Daniel and his father were separated from his mother and his sister, who he would never see again. Conditions in the camp were terrible. He was always cold and hungry. Powerful photographs and surviving relics of concentration camps painted the desperateness and helplessness that filled Daniel's life. Both he and his father were chosen to work at the factory at the camp; the work was backbreaking, but because of that, they received better rations than the other prisoners. Until this point, he had been telling his story through his diary, but we learned that his diary had since been confisticated by the Nazi guards, but he continued to record his life in his mind. Men were soon dying of starvation and sickness all around him. Days in the camp seemed to last forever until American soldiers liberated them. At the entrance of his exhibit, Daniel said "[h]ave you ever been punished for something you didn't do? We were." It left a powerful impression on me not only through his exhibit but through my entire trip there and beyond. I am sure it would be the same for all visitors as well. Though fictional, it was descriptive and powerful. Later on I found the exhibit was based on a novel by Carol Matas. I just might pick that up in the future. If you are interested in checking it out, I am including a link to Amazon below where you can do so. I came out of Daniel's Story exhibit and noticed I only have 30 minutes or so before I could enter the main exhibit, so I just wondered around the first floor and basement of the museum a little bit. The gift shop was typical of any museum, so it was not really worth mentioning. I also noticed several rooms where computer terminals were set up to aid research on the topic of the Holocaust, and a small screening room in the Wexner Learning Center where clips of the Nuremberg Trials were being shown. Hess, Göring, Kaltenbrummer, and other defendants' not guilty pleas left a strange feeling in my mind. I spent some time watching the Nuremberg Trials clips before entering the main exhibit. The main exhibit started off on the fourth floor, but the entrance was on the ground floor in the form of several elevators. While waiting for the elevator to arrive, we were encouraged to pick up one of the identification cards that told the story of someone who lived during the Holocaust. My card told the story of Miksa Deutsch, a Romanian-born Jew who ran a successful match importing business in Hungary. As Hungary aligned herself with Germany, Deutsch was eventually forced to surrender his business to the brother of the Hungarian Prime Minister Miklós Kállay, and he himself was sent to a concentration camp. He was last heard in a 10 Nov 1944 letter to his wife saying he was going to be force-marched to the Mauthausen concentration camp in Austria. Mauthausen was to become his end. What a way to prepare myself to the main exhibit, huh? In the elevator, a short film played as I ascended to the fourth floor. When the elevator door opened, the mood could not be mistaken: the exhibit was going to deliver a shockingly real message. On the wall was a large photograph of American soldiers observing a funeral pyre of the bodies of concentration camp victims. The charred bodies displayed in grotesquely large proportions disgusted me, but yet I could not take my eyes off of the picture. A lot of things went through my mind, and I had not yet begun to explore the main exhibit yet. The fourth floor was dedicated to the years leading up to the Holocaust. Some of the topics touched here include the rise of the Nazi Party (propaganda, book burnings and other rallies, boycotts against Jewish businesses), the science of race (the Nazi research of race and ethnicity), the Anschluss and the invasion of Poland, and Kristallnacht, the Night of Broken Glass. Beyond photographs, all topics were supported by a wide array of relics that survived the era. For example, an instrument used by Nazi scientists to measure nose widths and the damaged door of a synagogue were both on display in their respective areas. A large photograph of frantic German youths giving Adolf Hitler the stiff-armed Nazi salute, featuring two beautiful blonde teenage girls in the foreground, reminded me how much Hitler was supported and respected in Germany during that era; little did these girls who appeared no older than eighteen know where Hitler would lead them in the coming years. Finally, a reproduction of the red and white border gate that guarded the German-Polish border added a nice touch to the exhibit; it not only silently told the story of Nazi Germany's disregard for Poland's sovereignty, but it also functionally steered the museum visitors to view the displays in the intended sequence. The final display on the fourth floor was a three-sectioned, glass-windowed walkway with the names of communities destroyed by Nazi Germany during the Final Solution. A fourth section of this walkway was part of a three-floor "Tower of Faces" with walls completely covered by photographs of the people of the town of Eisiskes in Lithuania. 1,000 pre-war photos of its inhabitants covered the walls of the tower, and a display told the visitors that on between 25 and 27 Sep 1941, Nazi murderers massacred somewhere between 4,000 and 4,500 Jews from Eisiskes and surrounding towns and villages; only 29 escaped. As Eisiskes disappeared off of the face of the Earth, a piece of human history disappeared forever. After reading the description, I did not have the heart to remain in the tower too much longer, knowing that most, if not all, of the faces featured in the 1,000 photographs had all perished so violently. After descending a flight of stairs, I arrived on the third floor. This floor covered the bulk of what I expected to see at the Holocaust Memorial Museum. 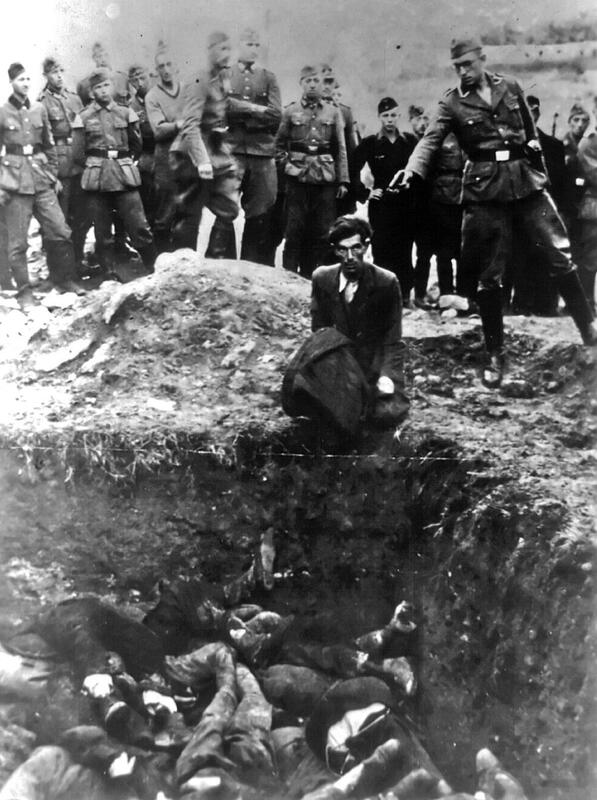 Titled "the Final Solution", the topics here covered the events between 1940 and 1945. A reconstructed concentration camp barracks, complete with the infamous triple-leveled bunks, probably stood out the most on this floor as the visitor walked through, but that did not take away the other relics and reconstructions on display on the third floor. 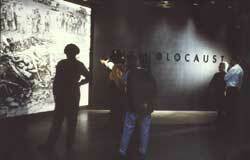 Like the fourth floor, the use of enlarged photographs delivered messages that could not be done with words. 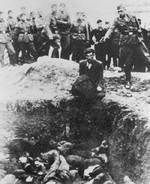 In the section that told the stories of Nazi mobile killing squads, the Library of Congress photo of an Ukrainian Jew with a strangely calm visage who was about to be executed was displayed on the wall. Below the photograph, I encountered the first quarter-height concrete wall that blocked the view to two television monitors. The monitors displayed photographs of these mobile killing squads as they traveled through eastern Europe, engaging in their termination of the supposedly inferior races. It was about this time when I realized the quietness of the museum despite the good crowd that day. As my fellow visitors leaned on the concrete wall and gazed down at the monitors, their faces were solemn, and I could tell the museum's displays had delivered their purpose, which was reflected by Elie Wiesel's statement "[f]or the dead and the living, we must bear witness." Another location where similar concrete walls were used to block younger visitors from seeing graphic videos was also found on this floor, where four such walls surrounded four monitors showing captured photographs of Nazi experiments on concentration camp prisoners. Two of the subjects shown were placed under great pressure and extreme cold as a part of a series of research to improve equipment of Luftwaffe pilots, while another subject had his photograph taken immediately before he was to be gassed so that the Nazi scientists and doctors could remove his skeleton for further studies. When the four monitors showed a series of photographs of severed limbs used for experiments, many of the onlookers turned away in disgust. Other topics covered on the third floor include resistance against the Holocaust (including a brief look at the White Rose Society) and the ghetto uprisings. The last display of the third floor was a glass-walled walkway that was situated under a similar walkway a floor above. In this walkway, the words etched on the glass were first names of those who perished in the Holocaust, grouped together by nationality. This was yet another one of the many little things in this museum that invoked so much thought and feeling. The fourth section of this walkway was the second floor of the "Tower of Faces" mentioned earlier. 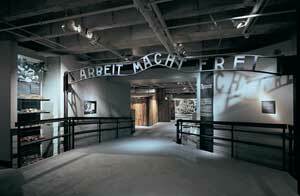 The final floor of this exhibit was on the second floor of the museum puts the visitors to the end of the Holocaust. Three television monitors showed footages of American, British, and Russian soldiers, respectively, as they liberated concentration camps. As the visitors rounded the corner, a television monitor displayed the Nuremberg Trials, which I did not dwell on, believing it was showing the same footage I had already seen earlier in the day. On the opposite wall, artworks drawn by children of the concentration camps were on display. Here, I observed mothers who clenched the hands of their children. I tried to imagine what must be going through their minds at that moment. Were they feeling the natural motherly instinct to keep their children from such fate? Or did they wonder in disbelief that the artists of the drawings, certain children of other mothers, lived through such tragedy? At the very end of the main exhibit, a small auditorium showed a video of interviews with Holocaust survivors. One survivor, a teary-eyed lady, struck me the most. To this date, she said, she could never forget all she had seen in the concentration camp and could never forgive those who committed such heinous acts; all she could do was teach her children and grandchildren to love, not hate. I concluded the main exhibit there. The lady's message of remembrance of the past and hope for the future was the perfect end of the tour for me. It was a powerful message that remained deeply etched in my heart. "Only guard yourself and guard your soul carefully, lest you forget the things your eyes saw, and lest these things depart your heart all the days of your life. And you shall make them known to your children and to your children's children." Before the message was a large marble block with an eternal flame burning on top. An inscription told that the marble block held urns of dirt from 38 concentration camps. 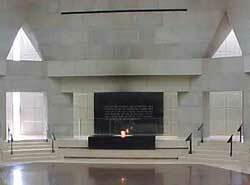 I walked up to the marble block and dipped my head and closed my eyes in silence for a brief moment to pay respect for those who were lost during the Holocaust; images of the displays I had seen that day rushed before me, and I could only hope that we, collectively as a whole, would learn from mistakes of the past to avert such tragedies from repeating. 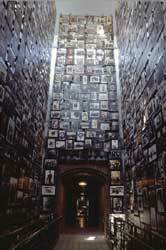 As a side note for those of you who may visit the USHMM in the future, unlike other parts of the museum, photography is allowed in the Hall of Remembrance. After spending about four hours at the United States Holocaust Memorial Museum, I walked out into the hot early summer of Washington DC and concluded my visit. I dare say that this museum, despite its young age, ranks with the best museums and memorials that I have visited in regards to the topic of the WW2 era for its dignified delivery and detailed presentation. I highly recommend all to visit the museum, though I do wonder whether the material may be too much for younger visitors to deal with. Special thanks go to Curt Millay and Diane Saltzman at the USHMM for granting WW2DB.com the permission to display some of the official USHMM photographs used in this article. Gen Baugher of http://www.scrapbookpages.com also generously gave WW2DB.com the permission to display the photograph of the Hall of Remembrance.